The issue of appearances is two-fold. There is the apparent behavior of others around us and then there is the question of how honest we publically portray our own true self. We can never judge the heart condition of others but we should know the true condition of our own salvation. We must be able to judge what is or is not sin and apply that judgment to our own lives. For that to happen we must know what is the meaning of the word of God versus what is merely man's commentary. This is especially true when your theology is largely founded upon something more than just the Holy Bible. Take the example of smoking which is a big part of the Adventist health message. It is obvious that this habit is bad for a person's health. How would you react if you discovered another Adventist smoking. Do you really believe someone is polluting the temple of the Holy Spirit if you see them smoking? That is, what does Scripture have to say about our physical health as it relates to salvation versus official Adventist teaching on the subject? Is it really their health or their salvation you are concerned for or is it the appearance of what they are doing? Now reverse this. If you struggle with this habit do you consider it merely a health issue or do you see this as something affecting your salvation? Do you candidly share with others your shortcomings or do you 'fake it' and keep these things to yourself? And, why is it so important to portray the appearance of having overcome the habit of smoking before you become an Adventist while orthodox Christian institutions have very effective programs that address this or the many other addictive habits by first focusing on becoming a born-again Holy Spirit indwelt Christian as the path to true freedom? True external appearance follows upon the internal heart condition of a person and not the other way around. An associated problem is the Adventist concept of the human spirit, where our spirit is thought to be nothing more than air God breathed into Adam, which ignores the fact that Adam and Eve's had spirits that died on the day they sinned, Gen. 2:15-17. This is why Jesus told Nicodemus that "your spirit must be reborn" (born again) before you can join the kingdom of God and have eternal life, John 3:1-15. Only as you submit to Jesus will you experience victory over sin through his work the of sanctification in your life. The point is that sinners are unable to change by their own power when they are dead in their sins, meaning their human spirit needs to be born again. If you are not born again and indwelt of the Holy Spirit then you are left with merely acting out what isn't real within your heart. For honest appearances that are seen by others you first repent of your sins, accept the biblical gospel message (1 Cor. 15:1-5) and submit to Jesus Christ as your Lord and Savior. You are now indwelt by the Holy Spirit (see Rom. 8:1-4) who brings your dead human spirit to life. A saintly appearance follows upon the change of your heart condition through the ongoing sanctification of Jesus Christ in your life as you submit to his lordship. Sanctification (victory over sin) is totally an ongoing work of Jesus in your 'life of the flesh'. Not understanding the condition of the human spirit of sinners leads to not understanding one of the key roles of Jesus' gift of the Holy Spirit. Those who have not accepted the biblical gospel by believing things that are not the gospel of Jesus Christ (see Gal. 1:9) are left with the unrelenting propensity of acting out the hollow appearance of having changed. While it certainly included the situation where you know of a conflict between two other parties, taken together these two quotes also includes when you are the offended person. 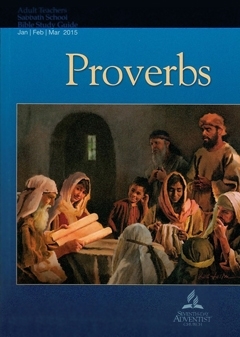 Proverbs advises us on how we are to respond when we know of when someone harms another person. Regardless of the situation the problem is between the two involved in the conflict. Your 'first response', tempered by the nature of what has happened, should be to seek to resolve this privately, whether you are the victim or not, instead of making a publically spectacle of the incident. Furthermore, unless you are a party to the incident you may not fully know what really happened. Be slow to anger and show your godly love by how you respect the privacy of others by not spreading gossip. Even in extreme cases where the nature of the incident has spiritual, moral or legal ramifications that must involve qualified mature third-party intervention, resorting to gossip will do little to bring about resolution or justice. Day Three, Monday, Feb. 9: Be Just! The theme for today is justice. The lesson begins by defining the Hebrew biblical understanding of God's justice which is good but only addresses one side of God's justice. While the follow up questions do allude to a more complete understanding God's justice it needs to be clearly stated. Notice that this quote references Isaiah 28:17. When you turn to Isaiah it is helpful to study the whole chapter to retain the context and a fuller understanding of God's justice. The lesson is correct in saying God's justice is 'coupled' with his other attributes such as love, charity and righteousness. The lesson has us turn to John 8:1-11 where we read of the woman guilty of adultery who was brought before Jesus by the scribes and the Pharisees. This account is an excellent illustration of the whole justice of God. According to the "Law of Moses" God's justice seemed to demand that she be stoned to death immediately. However, according to the same Law, before such a sentence is carried out the charge of adultery must be supported by the testimony of two or more witnesses, Deut. 17:6. However, the scribes and the Pharisees violated the same law because both the guilty man and woman must be charged and both put to death, Deut. 22:22. Whatever their secret sins may have been, the failure to bring both offenders before Jesus was a public display of their collective sin that was in violation of the same law the scribes and Pharisees were giving the appearance of upholding. After sending her accusers 'packing' Jesus was then free to reveal the full justice of God by speaking compassionately with the adulterous woman who made no pretence of being guiltless. Legally, according to the Law of Moses, Jesus would have been only one witness against her and choose not to censure her. Yet, being the Son of God he certainly knew of her guilt. Instead, he quietly said "go and sin no more". Instead of exercising the punitive side of justice he revealed himself to her as the Messiah who had the authority to forgive her sins, as he was the one who would soon to die for the sins of all the world. The death of Jesus' at Calvary is the ultimate display of the compassionate side of God's justice. God's justice has two major aspects, both punitive and benevolent, which taken together display his many others attributes such as his love, charity and righteousness. While the lesson does somewhat allude to the punitive side of God's justice by referring to Prov. 17:10 & 19:25, the lesson falls short of making this clear. Like the adulteress woman Jesus did not condemn, we must simply submit to the Lord Jesus Christ to receive the eternal benevolent justice of God. Jesus' death at Calvary for the complete finished atonement of the sins of the world is the supreme expression of the benevolent aspect of God's justice where we simply 'believe in the name of the only Son of God' to receive the eternal benevolent justice of God. This account of the adulterous woman includes the actions of the scribes and Pharisees who were in mortal danger of receiving the eternal punitive side of God's justice unless they also repented of their sins. The theme for today is: 'the power of words' both for good and for evil. The lesson brings out some important points found in Proverbs chapter eighteen that establishes the power of our words. The Apostle John makes the point in the opening verses of the Gospel of John that Jesus has always existed even before time begin, that he is 'very God himself and that all inspired Scripture is an expressing of who he is. While Jesus Christ is the source of all Scripture he no longer speaks to us 'by the prophets'. From the time of his incarnation and life among us that led him to Calvary he has spoken directly to fallen mankind. Please 'fill in the blanks' of how this affects the unique teachings of Adventism that rely so greatly upon the writings of Ellen G. White. Jesus is the Word of God and the last book of the Bible is his direct revelation to mankind. Therefore only Jesus can be called "The Spirit of Prophecy". Anything else is heresy. There is power in all words whether spoken or written and whether they are for good or for evil. Jesus Christ is called the Word of God because he has always been the source of inspiration. However inspiration in 'these last days' no longer comes to us through 'the prophets of old'. Therefore the title 'Spirit of Prophecy' can only refer to Jesus Christ. Associating that title with anyone else is heresy. "Fools are so sure of themselves and so eager to express their own opinions that they are not interested in learning from others. Their closed minds go along with their open mouths. This is a deadly combination. How careful we need to be that we don’t find ourselves doing the same thing, especially on a topic that we are convinced we are right about." Experience reveals that when two parties are in a confrontation over a matter there is often 'two sides to a story'. This simply means that at least 'one side of the story' is not complete because 'truth' will not contradict 'truth' for truth to have absolute meaning. Knowing that truth is ultimately an absolute let's consider where 'two sides to the story' has no place in our search for truth such as in the discussion of doctrines central to the biblical faith of Christians. To do that let's consider the unique Adventist doctrine of Investigative Judgment which was adopted as a way to explain why Our Lord and Savior Jesus Christ failed to return on Oct. 22, 1844. William Miller's calculations were central at arriving at this date starting with Daniel 8:14. Theologians realize there must be a biblical link between Daniel 8:14 and this date for it to have significance other than to show publically who is a fool. Desmond Ford challenged this doctrine which culminated in the "Glacier View" event held in August of 1980 and resulted in him being fired. Yet his challenge was not met then nor since. We have been waiting almost thirty-five years now for critically needed biblical support for this doctrine. Arguing that there are two sides to the story of what happen at the "Glacier View" event does not resolve the original charge that the doctrine of Investigative Judgment is false because it lacks needed biblical support. It is very true that where our sin-tainted self-interests are at stake we often tend to only view an issue from our limited understanding which has the potential of making any of us a fool. Ultimately God is our only reliable source of truth because this is one of his attributes. Therefore the inspired Scriptures given to fallen mankind can be our only standard for knowing what is truth. For truth to be what it is, truth can only be absolute. By the definition of who is a fool introduced in today's lesson the Adventist leadership who have failed to provide biblical support for the doctrine of Investigative Judgment must certainly be prime examples of who are fools. "Lying, in and of itself, is bad enough; but doing it in court and under oath is even worse. In many countries perjury is a crime, and a serious one at that. The witness must therefore give a truthful testimony." When we compare the New Testament references to Rahab with the account found in Joshua we see that Rahab acted in faith through the knowledge and fear of the one true God of Israel. Scripture makes no observations concerning the lie she told. However in spite of telling a lie she was justified by her faith in God that compelled her to act in the defense of the Hebrew spies. Since Scripture is clear that telling a lie is a sin what happens to this particular sin of Rahab's? And why are we so focused on just one of her sins when, as a prostitute, she obviously had sinned in many other ways. Like all other sinners she had a sin nature where her dead human spirit must be 'born-again' before she could have been declared justified by God and become part of the kingdom of God, John 3:1-15? Without resolving the question of whether or not it is ever ok to lie, we can conclude that when Rahab acted in faith and fear of the living God of Israel, as with all other sinners, she was declared justified by the coming shed blood of the Messiah Jesus Christ shed at Calvary. Her action of telling a lie in the very act of being declared justified illustrates for us that salvation is not about becoming perfectly sinless. Rather, we are saved only because our sins have been 'passed over' by the shed blood of Jesus. Scripture teaches that not telling the truth is a sin. While theologians have debated for centuries whether or not it's ok to tell a lie in certain situations without coming to an mutually agreeable conclusion, there are things we can learn from Rahab's story. Since Scripture says Rahab was justified by God through her faith expressed in the protection of the Hebrew spies which involved telling something that was not true we need to consider how her sin, all of her sin, could have been 'passed over'. At the very least the account of Rahab's faith reveals to us that she was credited as being justified without having reached a condition of sinless perfection. Notably, Rahab is honored both by being in the human genealogy of our Savior and is listed as one the saints of God found listed in Hebrews chapter eleven. It is not said she was any more sinless or perfect in her conduct than any other sinner covered by the blood of our Savior shed at Calvary.
" “The children of these complainers listen with open ears and receive the poison of disaffection. Parents are thus blindly closing the avenues through which the hearts of the children might be reached. How many families season their daily meals with doubt and questionings. They dissect the characters of their friends, and serve them up as a dainty dessert. A precious bit of slander is passed around the board to be commented upon, not only by adults, but by children. In this God is dishonored. Jesus said: ‘Inasmuch as ye have done it unto one of the least of these my brethren, ye have done it unto Me.’ Therefore Christ is slighted and abused by those who slander His servants.”—Testimonies for the Church, vol. 4, page 195." The evils of gossiping is the summary topic for today which is supported by this quote. Scripture does say gossiping is an evil, Proverbs 11:12-13; 20:19. This would have at least been in keeping with the intended topic as it is the very antithesis of gossiping. Consider also that there is a consistent definition of the word 'eternal' that should be objectively addressed. This illustrates the dangers of the common Adventist practice of 'proof testing' instead of keeping biblical quotes within their context. Gossiping is a sin yet this is not what Jesus was teaching in Ellen White's quotation. The seriousness of Jesus words quoted in Matthew 25:31-46 is that those who are righteous in the sight of God have a future of eternal life and those who are not righteous face eternal punishment. Notice that the word 'eternal' is used twice by Jesus in the same sentence and means the exact same thing both times. Eternal punishment is literally eternal in the same way that eternal life is eternal. Biblical themes, words and phrases used in Scripture must be kept within their contextual meaning and words must retain a consistent definition. In this case 'eternal' means 'ongoing forever without end'. Romans 12:20-21 suggests that the antithesis of gossip, the 'feeding of others', should portray our love for all sinners, even those who are our enemies. Copyright 2015 BibleStudiesForAdventists.com. All rights reserved. Revised February 4, 2015. This website is published by Life Assurance Ministries, Camp Verde, Arizona, USA, the publisher of Proclamation! Magazine. Contact email: BibleStudiesForAdventists@gmail.com. Annual Former Adventist Fellowship Conference held in Redlands, California.